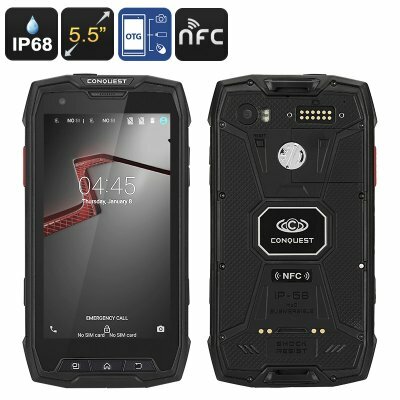 Successfully Added Conquest S9 Rugged Smartphone - IP68, Octa-Core CPU, Android OS, NFC, OTG, 2GB RAM, 5.5 Inch Display (Black) to your Shopping Cart. Meet the Conquest S6 Smartphone, a high-end rugged phone that is guaranteed to follow you anywhere no matter how tough the environment gets. A beautiful 5.5 Inch FHD display has been placed in a fully rugged IP68 body that offers complete protection against water, dust, and shocks. Running on an Android operating system this Chinese smartphone provides you with a smooth user experience that offers the latest features the mobile industry has to offer. For all of you who like to enjoy the features of a high-end smartphone yet, at the same time, enjoy an adventurous outdoor lifestyle, the Conquest S6 rugged phone is the ultimate device. This extremely durable smartphone is not only tough from the outside but also features some highly powerful hardware that lets you enjoy multi-tasking and mobile entertainment at an entire new level. Featuring a massive Octa-Core CPU that has been clocked at 1.5GHz along with 2GB of RAM and an Adreno 405 GPU the Conquest S6 is a smartphone that can handle the latest games, movies, and more in stunning detail and speed. So head out to the play store and enjoy the latest mobile entertainment on your stunning 5.5 inch 1080p IPS display. Portraying vivid colors and breathtaking detail this display truly brings your media to life. With its fully rugged body and IP68 rating this Chinese phone is the perfect cell phone to carry along when you head out on your next outdoor adventure. Featuring 4G connectivity and dual IMEI numbers this rugged phone allows you to be connected to two network providers simultaneously, providing you with a wider data coverage and ensuring that, no matter where you are, you always have the means to stay connected to the outside world. With its intergraded 13mp camera this Android smartphone allows you to snap breathtaking pictures while out on your next adventure and 32GB of internal storage offers enough space to save your pictures so that you can share them later with all your loved ones. This Chinese smartphone features an abundance of sensors, making it the perfect device to have at hand when heading out. A massive 6000mAh battery offers up to 10 hours of continuous usage time and a mesmerizing 480 hours of standby time. Its OTG feature furthermore allows you to use this Android phone as a powerbank, giving you the possibility to recharge other electronic devices in case of emergency.